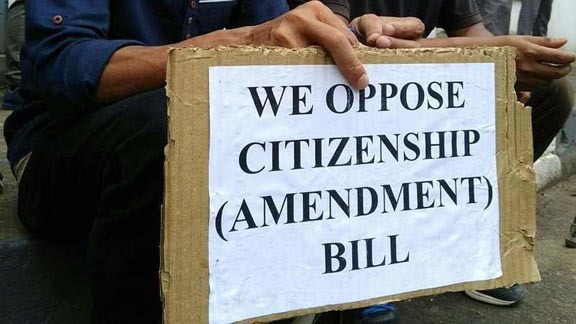 In an astounding move, the Asom Gana Parishad (AGP) and All India United Democratic Front (AIUDF) have joined hands to protest against the Citizenship (Amendment) Bill, 2016. The move happened at the budget session of the assembly which from Monday. The budget saw the opposition parties displaying placards and shouting slogans inside the assembly, reports GPlus. Assam Governor Jagdish Mukhi was unable to complete his speech. The house was then adjourned by speaker Hitendra Nath Goswami. In a meeting held at the assembly office of the AGP, on Sunday, both the parties decided to move ahead with this decision. “The illegal migrants’ problem should be solved and those who have come after 25 March 1971, Hindu or Muslims, will not be allowed to be naturalized in Assam. AIUDF and AGP have agreed on this as we are on the same plane,” said an AIUDF MLA.